I don’t know about you, but trying to find a modest dress these days that still looks stylish is pretty impossible. Not only that, but try to find one that is pregnancy or breastfeeding friendly and you’ve narrowed your search even further. I was so excited to be able to review a cute, modest dress for Mikarose recently. Mikarose is a clothing company that specializes in modest, elegant and fashionable dresses, skirts and attire for women. The goal of the company is to provide a wide range of modest dresses without sacrificing style or comfort. The clothes they sell are also very reasonably priced which is another bonus. I have been a Facebook follower of Mikarose for over a year but have been pregnant most of the time and didn’t really think their dresses could accommodate my pregnant belly. Knowing what I know now, I look forward to wearing their dresses during pregnancy. As most moms know, if you’re breastfeeding a baby you’re pretty much stuck with pants/skirts and a separate top…dresses are almost always out of the mix simply for ease of nursing the baby. Not only that, but if you do manage to find a dress that allows you to nurse a baby it isn’t usually the cutest thing in your closet. So I’ve got to be honest I was a little skeptical when I was asked to review this dress. I thought “there’s no way I’m really going to be able to nurse comfortably in this dress”. I was sent the Valerie dress (see it here) to try out. It comes is dark brown or red (which is currently on backorder). I am always a little hesitant to order clothes online because I’m not sure how they’ll fit, especially just a few weeks after giving birth. I ordered the size suggested on their website and found that the dress fit beautifully. I was also a little concerned about how the dress would fit length wise because I’m shorter than your average person at 5’2″ but I really liked where it fell on me, which was about mid-calf. As a post partum mom, I’m always a little self-conscious about my mommy tummy right after the baby is born (Zeb is about one month old). I liked that the Valerie dress had a bit of rouching around the tummy and helped me feel like my belly was camouflaged a bit. The dress overall was very comfortable and I wore it to church on Sunday. The moment of truth came for me when the baby woke up and was hungry. Was this really going to work? The beauty of this dress is that there is a little hook and eye closure on the front where it crosses across the body. I was able to nurse easily after unfastening the hook and eye. I use a cover when nursing as a general rule but was pleased with how easily I was able to feed Zeb and the amount of give in the fabric to be able to nurse comfortably. When I was done feeding the stretch in the fabric let it return to it’s normal shape without looking like I’d completely stretched it beyond where it should have been. Their clothes aren’t just for pregnant and nursing mamas. They’re for anyone wanting fashionable modest clothing at a reasonable price. I was very impressed with the quality of this dress and Mikarose will be one of my new “go to” stores when I’m shopping for myself. Perhaps the most important thing about the whole thing is that I felt pretty. I was able to wear a modest dress, that allowed me to nurse, and still be stylish all at the same time. I was delighted. I had several compliments on the dress throughout the day and as most of us know that is a huge deal to a new mom. As a special deal for my readers, you can get 10% off your order at Mikarose by using the coupon code blog2013 when you check out. I received one or more of the products mentioned above for free from Mikarose. Regardless, I only recommend products or services I use personally and believe will be good for my readers. I don’t usually use snack bags for our boys, but I was delighted to try Wexy Bags. Since we homeschool, I don’t pack lunches everyday but these did come in handy when we visited the zoo last week. The snack bags are BPA free and biodegradable! That means we can compost them. How cool is that? Another great thing about them is that they’re made in the USA (we always try to support products made here) and they can be reused again and again. While I really liked this product, perhaps my favorite thing was the website. The have a whole “Meet the Monsters” page. Each monster (there are 4 of them) has a story. One might have a special diet, one might like eating certain types of foods etc. It was a lot of fun for my boys to check out the site and it brought up some good discussion about vitamins, minerals and healthy food choices. We used the bags last week when we went to the zoo. I packed snacks in them and put crayons and little notepads in a couple of the bags for the little guys while we drove. I love the fact that each bag had one of the four monsters on the front, and since I have 4 boys it meant they each got their own bag. I think it would be cool to put a few little snacks and maybe popcorn in them for a special family movie night. You can learn more about Wexy bags by visiting their website, following them on Facebook or Twitter. Our family really likes dried fruit, but often times it is way expensive or tastes bitter and isn’t very good. I was delighted to receive Funky Monkey snacks to try and review. They come in these really fun packages and grabbed our attention right away. This isn’t just plain old dried fruit, but they really retain the flavor of the actual fruit. Funky Monkey has a unique freeze drying process that retains the flavor and the nutrients of the fruit. There is no high fructose corn syrup, artificial flavors or preservatives. Each ounce of Funky Monkey fruit contains 3 servings of real fruit. Wow! I was surprised at that fact alone! Flavors include : Applemon, Bananamon, Carnival mix, Purple funk and Jivealime. When these first came in the mail, the boys couldn’t wait to try them. In fact, we opened the first package and ate them as a snack, and then we opened the second and the third and the fourth. Only one package made it unopened until the next day. We all had our own favorite flavors. I really liked the Applemon (apple and cinnamon), the boys liked the Bananamon and Jivealime. My husband like the Purple Funk and Carnival Mix. There was definitely something for everyone in this mix. You can visit Funky Monkey snacks at http://funkymonkeysnacks.com/ or like them on Facebook and Twitter at https://www.facebook.com/FunkyMonkeySnacks or https://twitter.com/FunkyMonkeySnck. The snacks can be found at many retail and health food stores. One of my favorite things to do is read. I generally stick to non-fiction books, but the opportunity came to review the first book in a Christian Historical Romance Series. I really like history, but usually steer away from romance type books because they don’t support marriage and are usually a bit to graphic for me. Written by a Christian author I was open to the possibility of this book, especially because I used to really enjoy reading Janette Oak’s books with similar themes. The story drew me in fairly quickly. I like historical fiction, this book is set in 1881, and it sets the stage well. The characters were believable and likable. The premise of the book is that the main character becomes a mail-order bride so that she can be closer to her sister. She sacrifices a lot of freedom to be with her sister, who very much needs her. In classic romance style, you can see the relationship with her husband grow from one of awkwardness to one of respect and love. The fun part about this book for me was to watch the relationship really blossom. It was a story that I enjoyed reading and I would like to see where the rest of the story goes. Overall it was a good read and I enjoyed it. It was a great distraction from my usual genre. Penny Zeller began writing after a serious injury in a car accident. She was stuck at home for months in pain and not able to do very much and so she turned to prayer. It is from this she believes that the characters and the world just started to form. Eraselet Review and an Update! This is my original review but I have an update at the bottom! When I had the opportunity to review the Eraselet from http://www.eraselet.com/, I had 2 thoughts. My first was “Is this thing going to work?” and second “Are my kids going to like them?” The answer to both is absolutely yes! It seems like we’re always losing erasers on school days with the boys. Either they get pulled out of the mechanical pencils, broken off or chewed away and they’re constantly scratching out their mistakes. It makes their papers hard to read. And when we do find erasers…a fight often breaks out about who it belongs to. Eraselets solve both of these problems. They are worn on the wrist so they don’t get lost and better yet, I gave each of my boys a different color, so it was easy to tell which boy it belonged. to. The Eraselets came packaged like this. I have 4 boys ages 9, 7, 3, and almost 2, they each picked one and were set for the day. The two youngest really just liked wearing them and thought it was fun to stretch them and make the animals look funny. The cool thing about Eraselets is that they really can take a lot of stretching, in fact, my boys have yet to break one and they really worked them over! I was surprised because they’re actually quite thin and I was worried they would snap and break before the day was over. Eraselets come in a variety of colors and styles. You can even customize them to use for a school fundraiser, boost school spirit or advertising campaign for your business. They’re fairly easy to use for my two older guys. You just pull the Eraselet and hold it between your thumb and index finger and erase. They proved to be a bit more difficult for the 3 year old to use, but it seemed to work better if he took the Eraselet off first. One of the other things I really like about this company is that the product is made in the USA. Our family loves to support companies who are providing jobs to Americans when they need it most. So I was super pleased to find out that Eraselet is committed to keeping jobs here. Another cool thing about this company is that they give a portion of their profits to help “erase” hunger around the world and has partnered with several organizations such as Beautiful Feet Global Outreach. You can also visit http://www.eraseworldhunger.org to find out more about how they’re working to erase world hunger. Overall, our family has been delighted with the Eraselet. It was so neat to see how quickly the boys embraced them and how well they worked. They didn’t smear or smudge the pencil marks. To top it off they are reasonably priced at less than a dollar a bracelet. They’re definitely going on our “homeschool supply” list this fall. ***Update*** We’re still using these at our house and the boys still think they’re just as cool as when we first got them. I’ll often see them just wearing them for fun even on “non-school” days. These are really reasonably priced and would make great stocking stuffers for Christmas or even to put in an Operation Christmas Child box. Author ErinPosted on October 12, 2012 Categories Giveaways6 Comments on Eraselet Review and an Update! I cut out soda (or pop depending on where you live) several months ago. In fact, Zevia was the first soda I’ve had in probably 10 months or so. Zevia is made without the use of artificial sweetners. 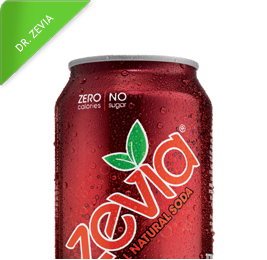 Zevia is made with Stevia is a plant from the sunflower family and originally native to South America. The stevia leaf is up to 300x sweeter than sugar but has no caloric value or effect on blood sugar levels. I was given 6 different flavors of Zevia to sample. The packaging said to make sure it was chilled before drinking, I generally don’t like warm soda but I have read some reviews of folks that tried it warm and said it really is much better cold. It could have been me, especially since I haven’t had soda in so long, but it was really sweet and really fizzy. My boys thought it was great, but for me and my pregnant taste buds the original cola and Dr. Zevia were both a little too sweet for me. I did like the Grapefruit citrus flavor the best, I think because it was pretty tangy. My husband liked the Mountain Zevia. He said it wasn’t as syrupy as the popular counterpart, but it wasn’t a dead ringer for the taste. The only one that didn’t get positive reviews from my family was the caffeine free soda. I don’t like caffeine free soda in general, it kind of tastes flat to me and this did too. A few weeks ago, we moved to a new town for my husband to pastor a new church. We have been shaking a lot of hands. It’s not always possible to wash our hands right after introductions and it’s not terribly polite either. We don’t generally use a lot of hand sanitize, but I was thankful to be able to put Susan Brown’s Baby Moisturizing Hand Sanitizer to the test. As the mom of 4 little boys (when one gets sick they all get sick and it takes forever to get out of our house), I was looking for something that isn’t as harsh as the commercial hand sanitizers found in stores. “Our pure and gentle luxury products are the result of years of research by my family. My father, a chemist of over 30 years, has been producing naturally hydrating cosmetic ingredients for some of the best-known skin care companies in the world such as Estée Lauder®, Chanel®, Clinique®, L’Oreal®, and Neutrogena®. I have to say, this product far exceeded my expectations. Initially it does smell like alcohol, as do most hand sanitizers, but as it dries it leaves a light scent behind which I love. It didn’t leave my hands feeling dry or irritated, in fact they felt like I had just put on lotion and were quite soft. I also had the opportunity to try some lotion and lotion to powder from Susan Brown. Such neat stuff! I don’t generally use powder on my children because I don’t want them inhaling the particles, but I like the way it feels especially in the warmer summer months. The lotion to powder is a great solution and the boys thought it was fun putting lotion on. I’ve enjoyed these products so much that they’re definitely going to become a staple in our house (and probably for every baby shower gift I give). To see the full line of Susan Brown’s Baby products check out their website. For all the latest information be sure follow Susan Brown’s Baby on Facebook & Twitter! I received the above products for free through Sublime Media Connection in exchange for an honest review. In no way was I asked to give a positive review. I don’t know about you but when it comes to sun glasses for my children, I have always purchased the cheapest and easiest pair I could find so that when the kids broke them I wouldn’t be out a bunch of money. With 4 little boys, sunglasses don’t really last very long around here. I was so surprised when these glasses came. First, I got a pair for 7-12 year old children. The boys picked the Glide style. They came in a really nice carrying case and some great literature for parents to read. One of the things I learned after reading the information included was why “toy” (see cheap) sunglasses are actually more dangerous for your children. as toys. Toys are great fun, but not so great at protecting something as vital as your child’s eyesight. In fact, most children’s sunglasses do not protect children’s eyes from harmful UV radiation. Don’t confuse the dark shading of lenses with their ability to filter out these harmful rays. Colored lenses on most toy sunglasses – no matter how dark – will not protect your child’s eyes. The truth is, wearing cheap toy sunglasses can actually do more harm to a child’s eyes than not wearing anything at all. Shaded lenses without 100% UV-A/UV-B protection will relax pupils, causing them to dilate and let MORE harmful radiation into children’s eyes. What’s more, not all sunglasses with “100% UV” protection labels pass the test. The second part that surprised me about these sunglasses is durability! We’ve had them for several weeks and they’ve held up nicely with the boys. They’ve been passed around to try from oldest to youngest. The older two boys (9 and 7) both commented on how comfortable the glasses were to wear and wore them for several hours at a time. The glasses came with a strap for really active times, but the boys felt like the glasses were secure enough without it and asked to take it off. I was so impressed that these glasses didn’t fall off the boys’ heads! Even the little guy (2) could wear them and they didn’t slip and slide, although they were a bit big for him. Real Kids Shades has a line for infants all the way up to 12 year olds! After reviewing this product, I plan on buying pairs for each of the other boys. I was impressed with the quality, the durability and the high level of protection it provides for my children. I get so frustrated spending lots of money for home phone service, that to be honest we don’t use that often. This is an alternative to land line phone service, that works at home or on the go. It is an affordable and easy to use VOIP device that can help you save money while still maintaining a home phone. When I received my Net Talk Duo, I waited a couple days to set it up because we had just moved and I wanted to make sure I had things in order before I did it. First, I had to install a USB driver, which was simple enough. Setting up the account was also simple. I had to select a phone number, but my area was not available. If you don’t need a local number, it shouldn’t be a big deal, for us though it was. With my husband’s line of work, it is important that we have a local number for folks to contact him easily. I did have a little trouble setting it up. My device was unable to register to the NetTalk network. I use a wireless connection at home, this week I did have a little trouble with the internet (not related to the Net Talk Duo). There is an option of connecting via cable, but I really liked the idea of how “mobile” the Net Talk Duo is so I was hesitant to try it. I decided to put things aside for a bit, thinking it might just be my brain fog interfering with the process. I came back about an hour later and tried again and the phone rang (indicating it’s working) and was ready to use, as it had connected to my wireless connection. I really think it was just me making things more complicated than they needed to be. After I had the phone ready to use, I called a couple people to test it out, most of the time they couldn’t tell I was talking on something other than my “regular” phone. The one issue I have had is with dropped calls, it seems that if I am on the phone for longer than 30 minutes my call is dropped, which can be quite frustrating. If you’re a “short and sweet” kind of phone person, you shouldn’t have a problem. 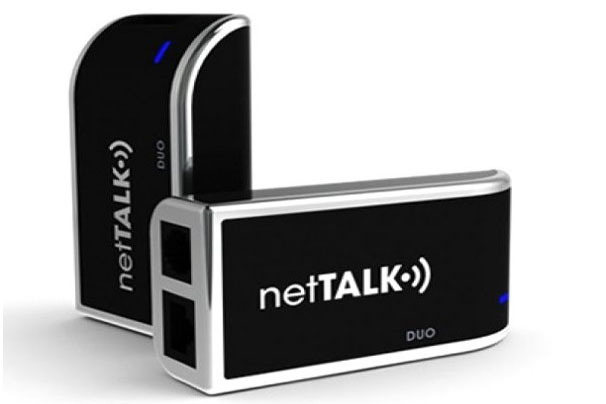 Overall, I am pleased with the NetTalk Duo, yes it is frustrating when calls are dropped, but there is a huge potential for savings here. We aren’t to the point where we’ll cancel our home phone service yet simply because we need the local number. But since we do have to pay a decent amount for long distance we could have the option of plugging it in when we want to make a long distance call. 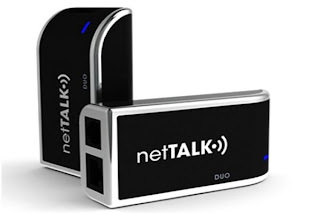 With the NetTalk Duo, you get a FREE year of home phone service after you purchase the device. After the first year, the service is an amazingly low $30 per year. That is seriously a fraction of what we spend on home phone service, and we get all the fancy features! Oh and for you Android users…Net TALK also has a new and free Android App (works on most Android devices) that provides Free Calling throughout the US and Canada with the option to add low-cost international TALK credits to make calls from anywhere to anywhere in the world (with cell phone / WiFi service) without running up cell phone minutes or roaming charges. Great for traveling and keeping in touch with family and friends abroad! The app is available free at www.nettalk.com and at Google Play. So, do you want to get this VOIP device? You can buy the device at major retailers such as Target, for less than $70. I’m also giving one away! “Finally, a serious solution to stop hiccups. Whether you get hiccups occasionally or suffer from them more frequently, you’ve come to the right place to stop them. Because this revolutionary, patent-pending hiccup stick is a must for everyone! You’ll be amazed as will your family and friends with this new fail-safe and simple method that stops hiccups in seconds. Why try all those silly, half-hazard and messy stunts like standing on your head, holding your breath, swallowing endless amounts of sugar, drinking water upside down or shoving lemons in your mouth? The lists of old wives’ tales are endless. But do they really work? You tell us. I was a little skeptical when I first saw the product, but after reading several reviews, I’m convinced it could actually work. I look forward to trying it and we have it handy for the next time someone other than the 2 year old gets the hiccups.